What Day Of The Week Is June 21? 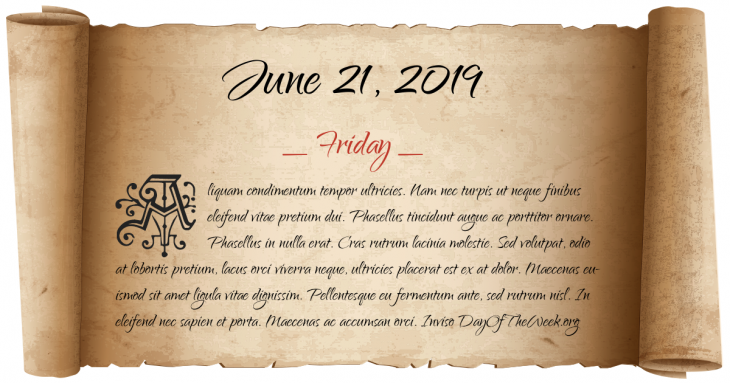 June 21, 2019 is the 172nd day of the year 2019 in the Gregorian calendar. There are 193 days remaining until the end of the year. The day of the week is Friday. Execution of 27 Czech noblemen on the Old Town Square in Prague as a consequence of the Battle of White Mountain. Halifax, Nova Scotia, is founded. James Otis, Jr. offends the King and Parliament in a speech to the Massachusetts General Court. Greek War of Independence: Egyptian forces capture Psara in the Aegean Sea. World War II: A Japanese submarine surfaces near the Columbia River in Oregon, firing 17 shells at nearby Fort Stevens in one of only a handful of attacks by the Japanese against the United States mainland. World War II: Tobruk falls to Italian and German forces. Three civil rights workers, Andrew Goodman, James Chaney and Mickey Schwerner, are murdered in Neshoba County, Mississippi, United States, by members of the Ku Klux Klan. Bülent Ecevit, of CHP forms the new government of Turkey. John Hinckley is found not guilty by reason of insanity for the attempted assassination of U.S. President Ronald Reagan. Pluto’s newly discovered moons are officially named Nix & Hydra. Who were born on June 21?